India’s opening batsman Shikhar Dhawan came back to form in style. After a lean patch, he struck a magnificent century in the 4th ODI against Australia in Mohali. The opener made 143 runs from just 115 balls with 18 fours and 3 sixes. Along with Rohit Sharma, he added 193 runs for the first wicket that gave India a great platform for a big score. The left-hander was being criticized for his poor run of form earlier. Even his place in the World Cup squad was questioned. But the Delhi-lad responded in the best possible manner. 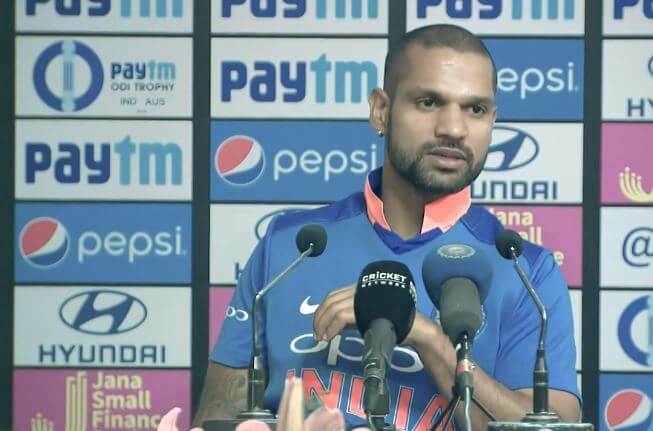 Even though India lost the game despite scoring 358, Dhawan was satisfied with his knock and is ready to put aside the loss to focus on the next game. “I enjoyed my inning and it was very satisfying. To score a century is always satisfying. Sad that we lost the game, we had a good total on the board but it’s alright, we’ve got another game coming up, so we would put this game aside and move ahead and keep the energies high for the next game,” said Dhawan in the post-match press conference. “I really don’t know what’s being written in the newspaper. I just make sure that I stay in my good positive mind. That’s it. And keep doing the process and things just come on its own,” Dhawan talked about he how stayed focussed and didn’t let the criticism affect him. India rested MS Dhoni for the last 2 ODIs which meant Rishabh Pant was slotted in. But the 21-year-old didn’t have the best of times behind the stumps. He missed a catch as well as a stumping chance of Ashton Turner who ran away with the game. The Mohali crowd wasn’t happy with Pant as after the missed opportunity, they started chanting Dhoni’s name. But Shikhar Dhawan believes it’s unfair to compare Pant with Dhoni and the youngster should be given time to grow. “Rishabh is a young bloke and you have to give time to the youngsters. He should not be compared with MS Dhoni considering Dhoni has played so many games and has been playing for so many years. Of course, had the stumping chance been taken, it could have turned the game. But after that, the game slipped away from our hands pretty quickly. The dew also played a big role in the game but that’s what it is,” added the Indian opener.